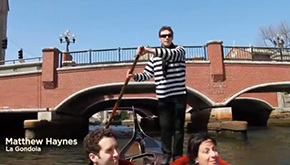 This video was produced by the Providence Warwick Convention & Visitors Bureau and is set to play in Hartford and Boston. Thoughts? Cute video and a great idea to show it in local day-trip markets. But that font usage & placement on the last frme & preview image are embarassingly ugly. I think this is a bit over the top. I’m sure the quotes are accurate, but it strikes me the city is trying too hard. I agree the font choice, placement, color — everything about that font is ugly, a pretty basic oversight for the ‘Creative Capital’. Also I feel like they missed an opportunity to show some only-in-Providence scenes/locations to highlight the city’s visual or spacial appeal better. A shot of the Fleet Library, or of the skyline from Prospect Park, or Benefit Street in the evening with the gaslamps lit up, or WaterFire, or the Grant’s Block Bocce games, etc etc. Still, it’s nice to highlight the city’s various rankings and placements of late by a good variety of people. If the goal is to make Providence seem metropolitan, everything except for that font does the job. I agree with those saying they should have shown more views of the city or been more informative. It just seems like a bunch of talking heads and not much else. I know it’s supposed to be charming, but I hate videos that rely on real people to deliver repeated, scripted lines. It’s formulaic and comes off like a cheap local TV spot – like something the Cardis or any of the local car dealerships might make. I’m sure other cities’ promotional videos are just as cheesy. I think Providence can do better. To my eyes, it’s too sanitary…reminds me of that TV series ‘Providence’ that aired about a decade ago. It also has a vaguely empty feeling, maybe because there is no footage of street life. Seems like any other “Come visit our city!” type commercial I’ve seen of other cities or states but that ending with that uninspired font is really ugly and screams amateur. Seeing how it is the last thing you see it really sticks and that is not a good thing.